The importance of beautiful lips in keeping your elated beauty and personality can’t be measured in simpler terms, for many it is invaluable. It is true that your lips would immensely contribute to make up for your special appearance, at the same time, it is also worth making note of the fact that they can nullify the negative effect or impression created by any other facial part. Lips are also sensitive and perform multiple functions, helping men and women to tackle several critical activities day in and day out. Though it is very desirable to have ideally positioned and shaped lips, unfortunate abnormalities pertaining to the lips are pretty common. While there are some naturally acquired abnormalities, there are also issues with timely degeneration which means your lips are vulnerable too. You have no reason to be unrest about if you are dealing with unimpressive lips as the lip enhancement procedures at Manchester Clinic can help you with a new pair of lips, renewed with Lip Fillers. Though the purpose of Lip Fillers is to facilitate a better look and texture of your lips, the overall objective is to enhance the impression of your face which is directly impacted by your lips as healthy lips can always improve the facial glow. Choose Manchester Clinic for bundle of benefits that are not just limited for your lip enhancement therapy. The real purpose of various cosmetic therapies is to help men and women to attain an enhanced and revived personality which is possible by identifying the abnormalities followed by recommending apt solutions. Considering the fact that lips have the most significant contribution in enhancing a person’s beauty, the focus about lip enhancement through cosmetic procedures is well justified. Cosmetology doesn’t have to be always about major surgeries and complex procedures. It has simple solutions for complex conditions and rightly so procedure like lip enhancement with Lip Fillers wouldn’t require a lot of time. They are time-tested procedures with adequate data backing which of course indicate the credibility and reliability too. Premium cosmetic treatment centers are making significant progress in offering exclusive solutions for new generation demands, our Manchester Clinic has its own uniqueness in terms of channelizing finest of the treatment procedures to make them personal and relevant. Lip Fillers are nothing but special injections used to redefine your lips with sustainable effect of supporting all the routine functions while offering a new external impression. It is only about specific cosmetic changes enhancing the appearance of lips for good while not altering the physical and functional properties of your lips. Your choice of our Manchester Clinic would mean to opt for comprehensive benefits as we always believe in methodical approach that coves both the healthcare and cosmetic objectives. You can expect a friendly and engaging session of consultation during which the cosmetic therapy experts take you through the procedure’s overview, benefits, limitations and awareness about post therapy care. You may be happy to know that smart positioning of the Lip Fillers is not done through a surgical process; instead they are injected on the target regions. We choose to offer advanced Lip Fillers like Juvederm Smile® that are more proactive and sophisticated than the traditional ones. The key advantage of the fillers we use as part of the lip enhancement procedure is that they provide more natural look and flexibility that your lips require. Since the procedure is simple and can be implemented in half an hour’s time, you can also plan your consultation and treatment on the same day. You can also let us know about the options you are considering for your lip enhancement and if it is appropriate we will facilitate the procedure with your choice of fillers while taking cognizance of overall benefits and possible limitations. Juvederm Smile® is known to be effective in terms of being less painful and more comfortable, which is the sole reason for us to recommend is as a premium cosmetic solution. The therapy has few simple steps; first the target area will be cleaned up and prepared for therapy with anesthesia. 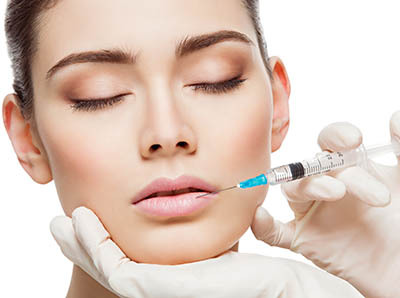 This is followed by serious of injections; they are nothing but the fillers which are followed by injecting dermal fillers. Once the injecting phase of the respective fillers is over, your lips will be massaged to help the fillers to adjust well and also ensure the external shape of the lips has emerged as expected. This procedure may last up to thirty minutes and you can feel the difference within a very short span of time. There are fewer risks and side effects with lip enlargement with Lip Fillers as it is not a surgical procedure unlike many other cosmetic therapies. However it is the nature of cosmetic treatments that one should be concerned about as part of the preparatory phase. Your choice of cosmetic clinic would mean a lot in this context as it can impact the final outcome. The cosmetic specialists and experts at our Manchester Clinic have thorough knowledge and adequate hands-on experience in performing lip enhancement therapies; they are pretty much compliant with the cosmetic standards, norms and protocols. Our uniqueness is defined by our specialists’ caliber to exclusively treat specific conditions by also being mindful about your overall health and other priorities. Immediately after the therapy, you may experience swelling, especially at the injection locations. This is a temporary reaction and it doesn’t need any special care as the swelling would subside on its own. Similarly, if there is any bruising effect, it will subside within 24 to 48 hours. Nu Cosmetic Clinic is a reputed name in cosmetology with dedicated centers for cosmetic care and treatment across the UK. You can be confident about the care and support you get from other locations at par with the Manchester Clinic.